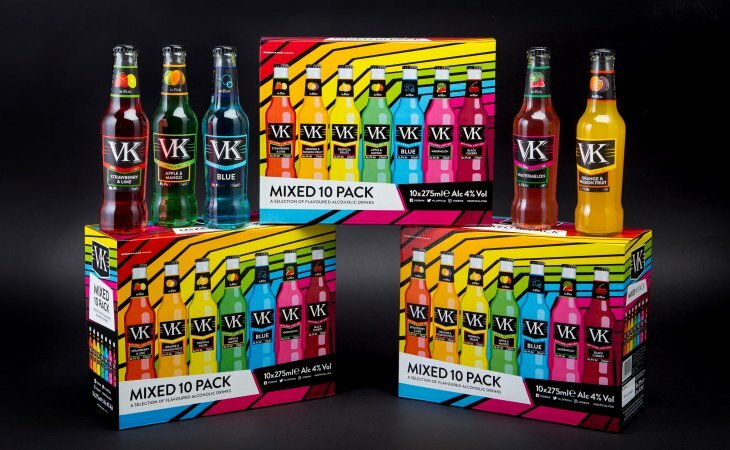 The fastest growing traditional RTD in the UK’s off-trade VK, is taking its best-selling mixed pack to the next level by revamping the design. The disruptive, colourful new look will add to shelf stand out and modernise the existing pack. The pack will also now include the newest flavour, VK Watermelon, which was launched after a crowd sourcing campaign to find a new variant. VK Watermelon received 33,000 consumer votes and the campaign was viewed by over six million. The VK mixed pack is outperforming competitors across the board, +18% in value and +19% in volume YoY. The mixed pack also has the best ROS of all RTD ten packs, adding almost £2million to the category in the last year. 2019 marks the 20th anniversary of the brand, with an exciting summer of activity ahead and a huge multi-channel campaign kicking off in May. The revamped mixed pack will be hitting shelves in Asda, B&M, Home Bargains, Spar, Nisa and independent convenience stores across the country from next week. VK is an award-winning range of ready to drink beverages and the only brand to revolutionise the RTD category. With eight variants: VK Blue, VK Ice, VK Strawberry & Lime, VK Orange & Passion Fruit, VK Black Cherry, VK Tropical Fruits, VK Apple & Mango and the new crowd sourced flavour VK Watermelon the brand has a wide range of delicious flavours. Mixed to 4% ABV, VK is available in Asda, Morrisons and convenience retailers. Number one for students the brand is the best performing traditional RTD in the off-trade growing +22% in value and +21% in volume and boasts a mixed pack outperforming competitors. Global Brands is the UK’s leading independent drinks brand development business. Owning, marketing and distributing a collection of award-winning products across the RTD, premium soft drinks, tonics and mixers, spirits and beer categories internationally. Founded in 1997, having spotted an opportunity in the booming RTD category, Global Brands shot to success with RTD brand VK. This entrepreneurial vision has subsequently generated a portfolio of market leading products, putting Global Brands on the path to be the UK’s number one drinks company. Global Brands’ line-up includes fantastic brands, such as VK, Hooch, All Shook Up, Crooked Beverage Co, Franklin & Sons premium soft drinks and tonics, Hooper’s and Amigos Tequila Beer.